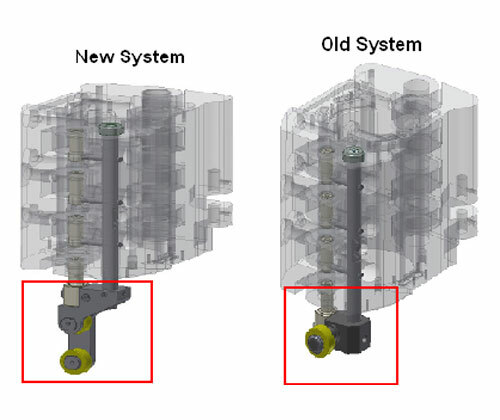 This upgrade is a new technical solution for reducing the torque loads on the mold closing shaft, thanks to in-line bearings. 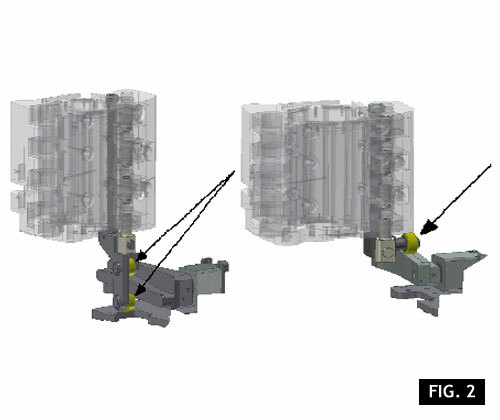 The mechanism of mold-holder closing has been radically modified. As in upgrade ZF010041 concerning the mold bottom support group, the lockbolt bearing has been positioned in line as to the point of force application, thus minimizing the mold-holders efforts during the phase of lockbolt insertion. This upgrade considerably increases the life duration of the bushings, which needed long stops and considerable costs to be replaced. Moreover, the lockbolt ascent/descent cam has been improved, by optimizing its profile through special simulation software and by revising its positioning, thus reducing the machine noise and ensuring more fluid movements. As you can see in the above picture, there are two bearings (indicated by the arrows) instead of one, as in previous versions. - From the series featuring the pneumatic system and in further versions. - Longer life of bushings and mold closing pins.